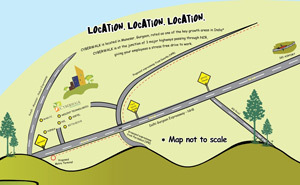 CYBERWALK is located in a 150 acre IT & R&D hub in IMT Manesar, Gurgaon, rated as one of the key growth areas in India*. 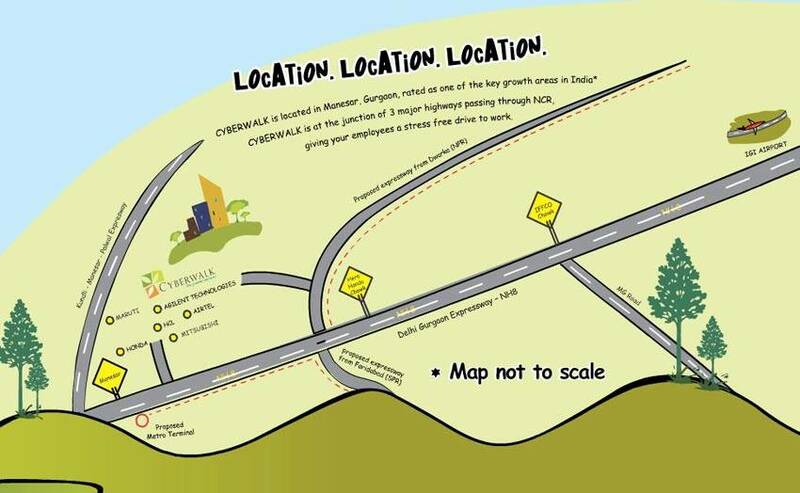 CYBERWALK is at the junction of 3 major highways passing through Delhi NCR, giving your employees a stress free drive to work. Manesar boasts of state of art office buildings and excellent infrastructure, making it a wonderful choice for the businesses, which are looking for a futuristic IT Park and IT Office Space in Manesar, Gurgaon. "Under the Gurgaon-Manesar Master Plan 2021, Manesar is a part of District Gurgaon, which is already the single largest destination in India for Multinational and Indian corporations. CYBERWALK enjoys the locational and infrastructural advantages of Manesar and a neighborhood that boasts of IT/ITeS powerhouses, best-in-class infrastructure with adequate power, water supply, wide roads, super specialty hospital, golf course, hotels, helipad and many more."